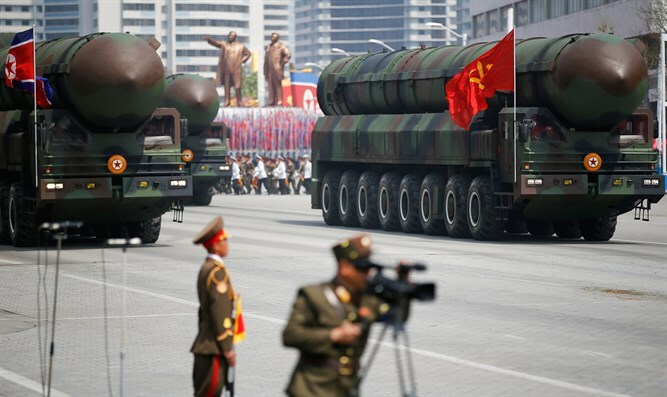 During parade, North Korea shows off new ICBM; experts argue on whether it is solid-fuel or not. North Korea on Saturday may have unveiled a new intercontinental ballistic missile (ICBM) at a giant military parade in Pyongyang, analysts said. In a show of power marking the 105th birthday of North Korea's founder, nearly 60 missiles were paraded through Kim II-Sung Square. North Korean Dictator Kim Jong Un did not speak during the parade honoring his grandfather, but looked on. Four green missiles towards the parade's end caught the attention of military specialists. "This appears to be a new ICBM," an unidentified South Korean military official told the Yonhap news agency. He also said the new ICBMs are longer than the existing KN-08 or KN-14 missiles. NK News Specialist Service Managing Director Chad O'Carroll told AFP the new missile would be "a big game-changer once it is deployed in service" but added it would "take hours to fuel up and if there is intelligence that they were doing that it would be quite easy to stop it before it was launched." Solid-fuel ICMBs are a "much more difficult threat to prevent," he said, adding that North Korea was "many many years" away from the capability. South Korea's Institute for Far Eastern Studies professor Kim Dong-Yeop disagreed, and told Yonhap, "Judging from the fact that it was contained in a launch tube, it is likely to be a cold-launched, solid-fuel ICBM." He also said North Korea is developing a technique to ensure its ICBM-capable launchers will not be damaged during launches. The technique will also make missiles harder to detect after launch, and allow them to be fired from silos. Researcher Melissa Hanham said the launcher the KN-15 was on "uses caterpillar treads which means it can go off road more easily, which mean they can hide them more easily." She also said the launch vehicles were made in North Korea. Also on display were tanks, artillery, multiple rocket launchers, and a solid-fuel missile designed for launch from submarines. North Korea often marks significant dates with shows of military force, and analysts had suggested it might detonate a nuclear weapon to celebrate Saturday's occasion, after it was reported that North Korean sources told foreign journalists located in the country to prepare for "something big and important."